The bicycling public has a chance to talk directly with the city staff in charge of updating Seattle’s Bicycle Master Plan at three public meetings this week. 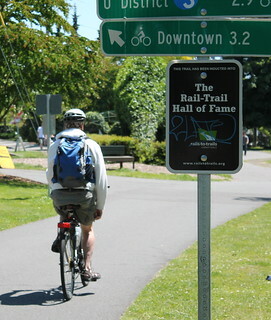 The goal of the master plan, first approved in 2007, is to make bicycling a safe and integral part of getting around Seattle. Tuesday (Nov. 13) at UW Gould Hall, NE 40th Street between University Way NE and 15th Avenue NE. A draft citywide map of proposed bicycle routes, bike lanes, greenways, cycle tracks, sharrows, and other bike infrastructure will be available so bicyclists can find gaps or suggest improvements. Also, the city says that several Seattle Bicycle Advisory Board members will be on hand on Wednesday for small group discussions at 6:15 p.m. The discussions will be organized into six sectors — northwest, northeast, central, downtown, southeast and southwest. People are invited to drop in at anytime for the meetings. The city staff says it wants the opinions of both regular bicycle users on the streets of Seattle and those who have thought of taking the plunge, but haven’t done so. If you can’t make one of these meetings, an online Lunch and Learn session is planned frim 12 to 1 p.m. Thursday (Nov. 15). Space is limited, so register at https://www3.gotomeeting.com/register/71837068 . The city’s transportation staff will share material that was available at the public meetings. To prepare yourself for any of the meetings, check out the Bicycle Master Plan website, especially the Project Library that includes the presentations to the Seattle Bicycle Advisory Board in preparation to the update.